Exceptional, entertainer's dream floor plan! 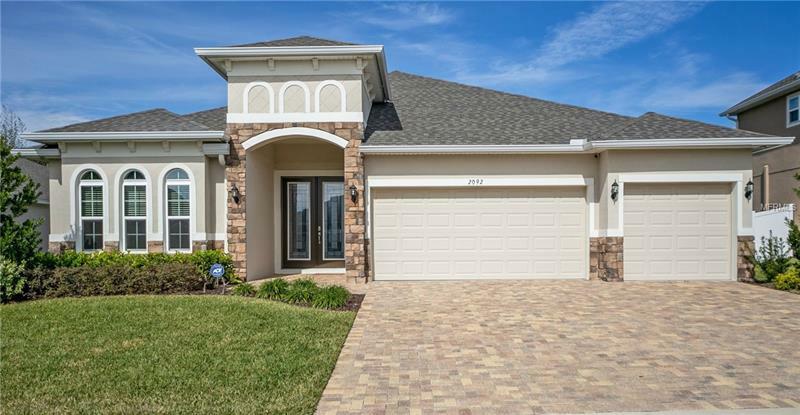 This open concept beauty, built in 2017, is designed with popular wood plank style ceramic tile throughout the main living areas. Upon arrival, elegant, leaded glass double doors welcome your guests. Entry foyer offers lovely space for your art collection or that special piece of furniture. The spacious great room will accommodate your largest family gatherings around the gas fireplace. The chef in the house will love the gas cooktop, stainless steel double oven, dishwasher, microwave and side by side refrigerator! Roll out that pizza or cookie dough on the stunning quartz countertops. The island is perfect for quick meals or a huge buffet. Plenty of storage space in the 42" crisp, white cabinets with under cabinet lighting and crown molding and huge walk in pantry. Just off the kitchen is the perfect home management center, hobby room, butler's pantry or mud room. Laundry is a breeze with energy efficient, gas washer and dryer. The master suite is a peaceful retreat with huge glass shower, dual separate vanities with quartz counters and walk in closets.Secondary, bedroom two and three are split away for privacy. Bedroom four is a lovely, private guest suite. The great room opens through pocket sliding glass doors to a generous covered, screened patio and out to fully fenced rear yard.Every detail was considered including security system, R-38 attic insulation, low E double pane windows, exterior flood lights, special holiday light outlets and rain gutters!